As you would suspect, once these are gone, there is no guarantee of getting any more of these rare and elusive beauties. 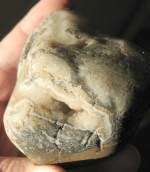 We will give as much information about the stones as we know. Some will be absolutely certain, some will be good educated guesses, often by Wayne Shortridge, who is definitely one of the best in the business of locality identification. 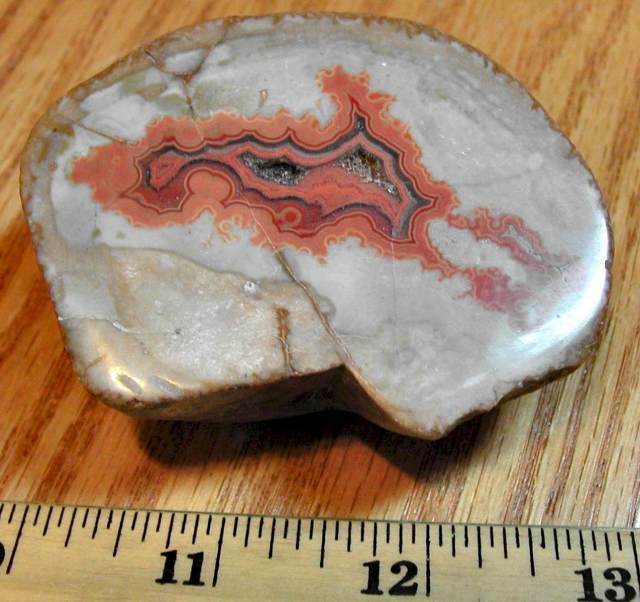 Stock numbers with NE in them will be Nebraska agates, SD for South Dakota, and WY for Wyoming. TP will indicate Tepee Canyon, SP for Custer State Park, and so on. X will indicate unknown localities. Some other codes will simply indicate consignment materials. 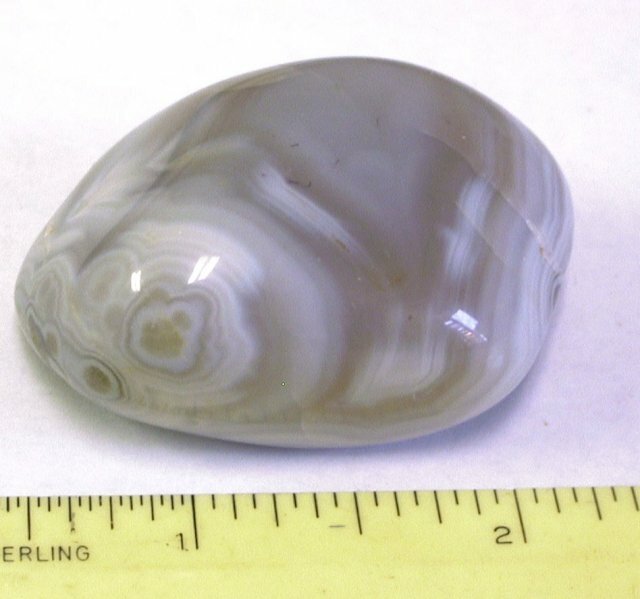 We have no northeastern Colorado agates in our collection, let alone for sale, as they are very rare (as though the other aren't!) Some will be polished, some unpolished. 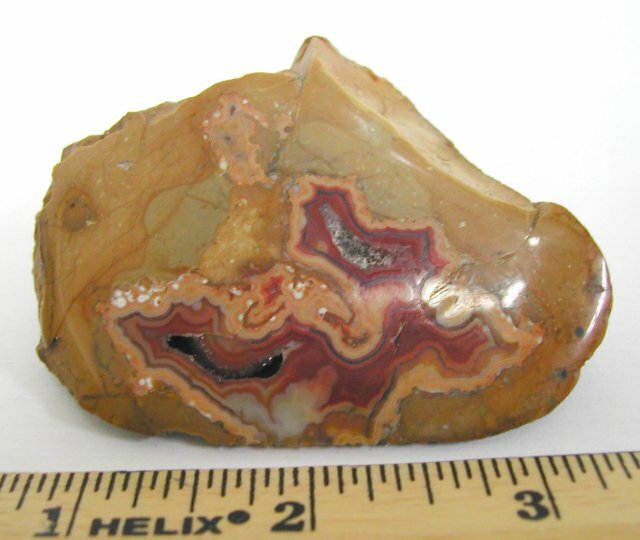 We may on occasion give the agates a coat of removable mineral oil in order to bring out the color and pattern in photographing. We also have a number of pounds of small/medium sized Fairburns and Lakers for sale up to 2 inches or more, some polished, some not. 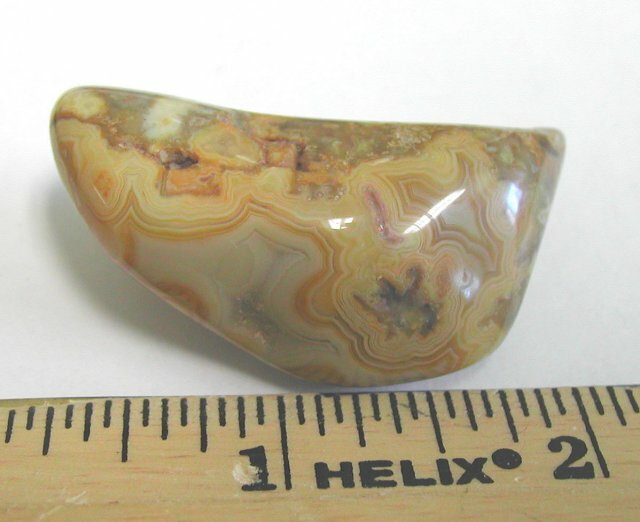 These are cheaper agates because of size, pattern, and/or color. 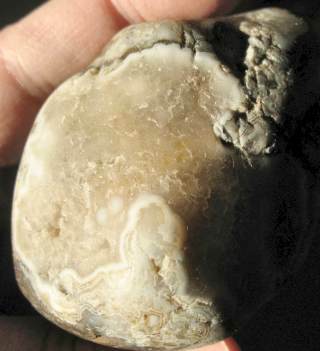 Many are tumbled, some are natural. We do hope to eventually get some of them posted here, but there are too many to show all of them. If you have an interest in buying a quantity of these, please contact us. 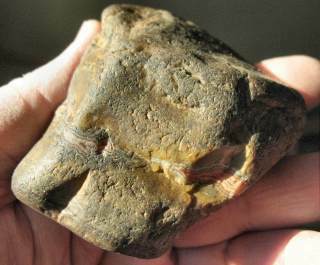 NOTE: Prices at the Crawford Rock Swap in recent years were mostly quite high for anything decent in the Fairburn realm. We saw asking prices all the way up to $6,000 for a single agate! 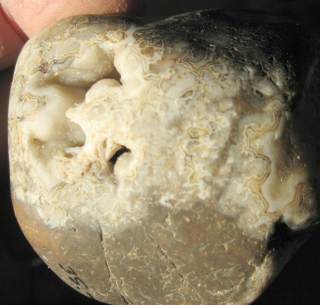 Prices continue to climb as demand increases and more people hunt the rock beds, making finding good agates tougher each year due to increased competition. Asking prices on old collections skyrocket as well! 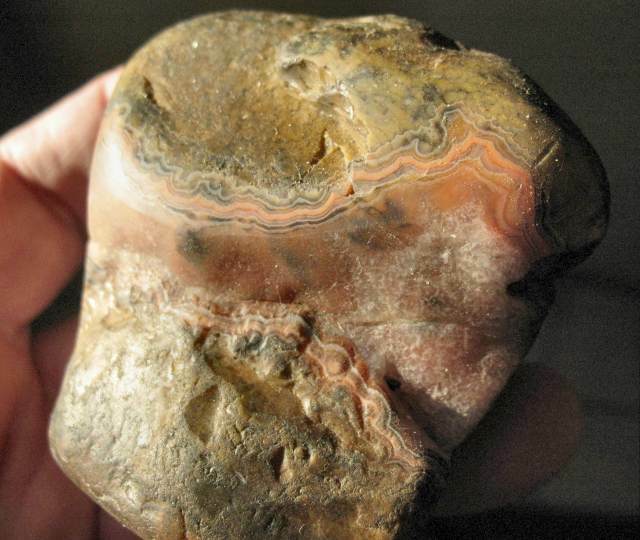 Do not miss our Fairburn agate photo gallery if you are a fairburn fan. SOLD. #FBSD55. 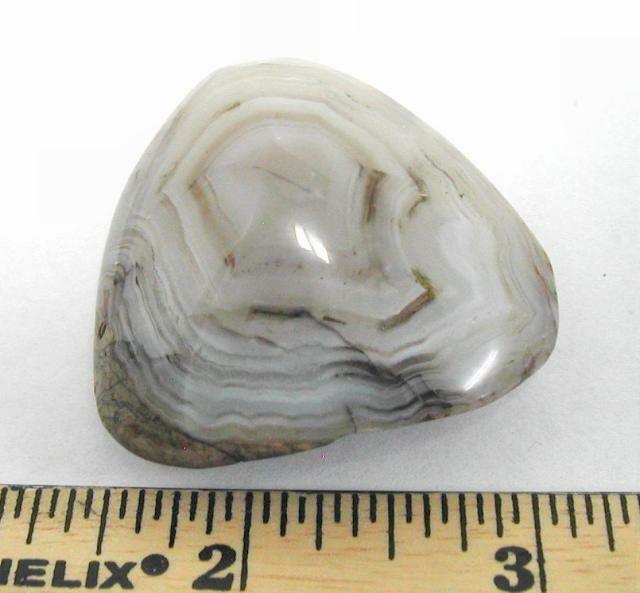 White and gray agate, probably from the reservation areas. 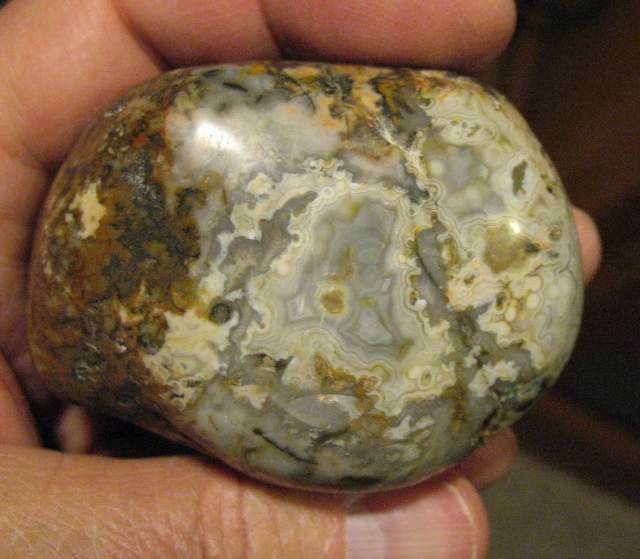 Partially polished. 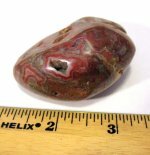 1-3/4". $7.00. #FBSD65. 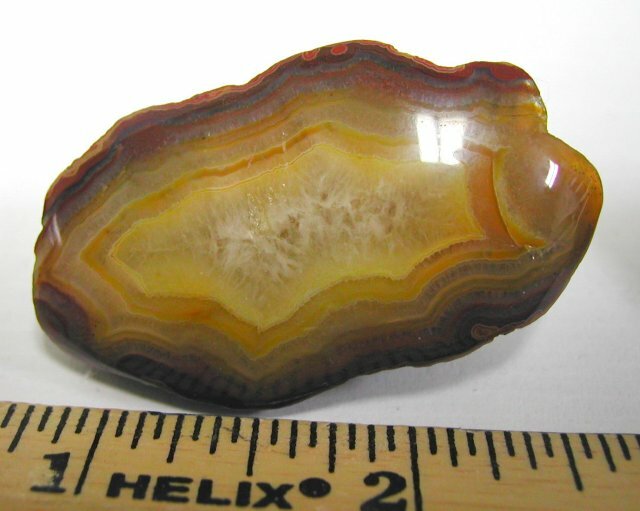 Face polished agate. 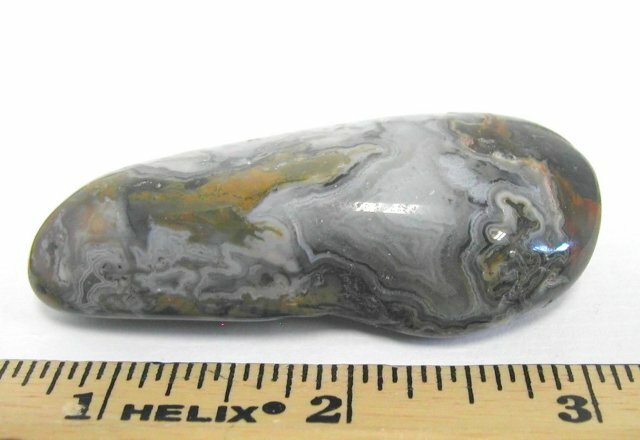 1-1/4". $5.00. SOLD. #FBSD139. A real pretty pattern in red, off-white, and tan. Unsure of locality. 0.9 oz. 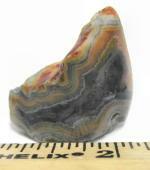 1.75" x 7/8" x 5/8" $30.00. #FBSD152. 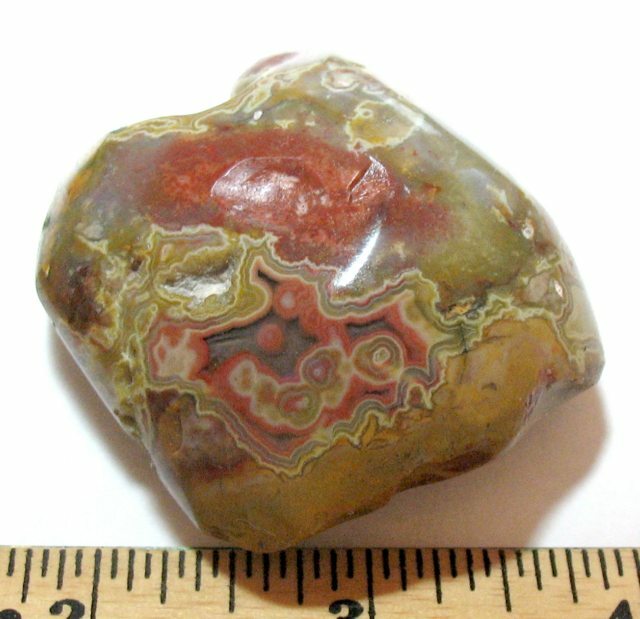 Red/pink patterns on dark gray. Pattern has been surface sanded, except for backside, seen here. 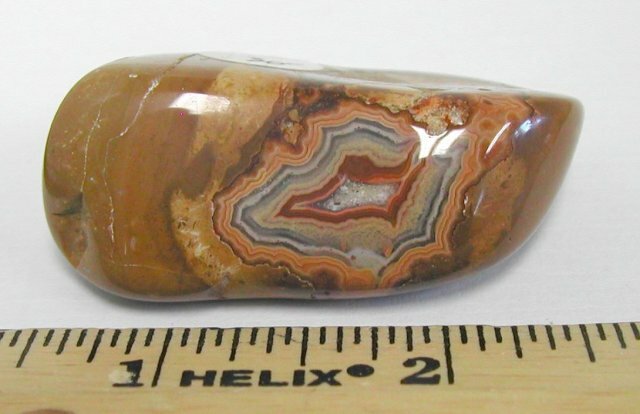 2.5" x 2.5" x 1-1/4", 8.0 oz. $20.00. SOLD. #FBNE4. 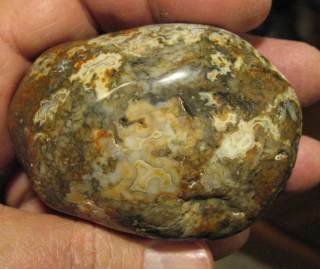 And another polished one from Nebraska. 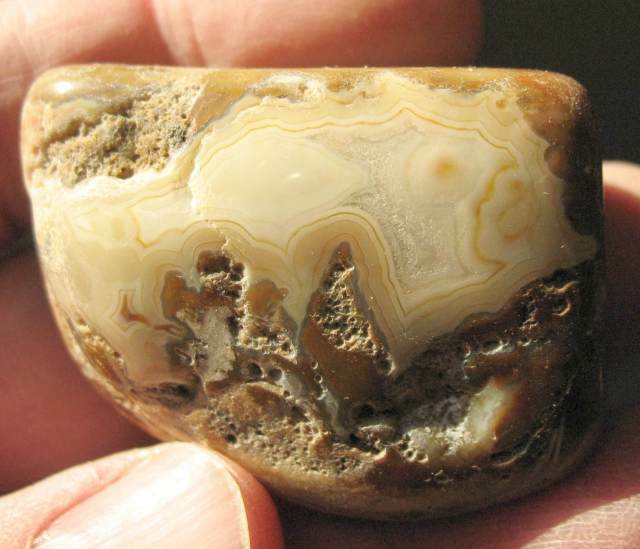 If you like yellow, this one has nice pattern. 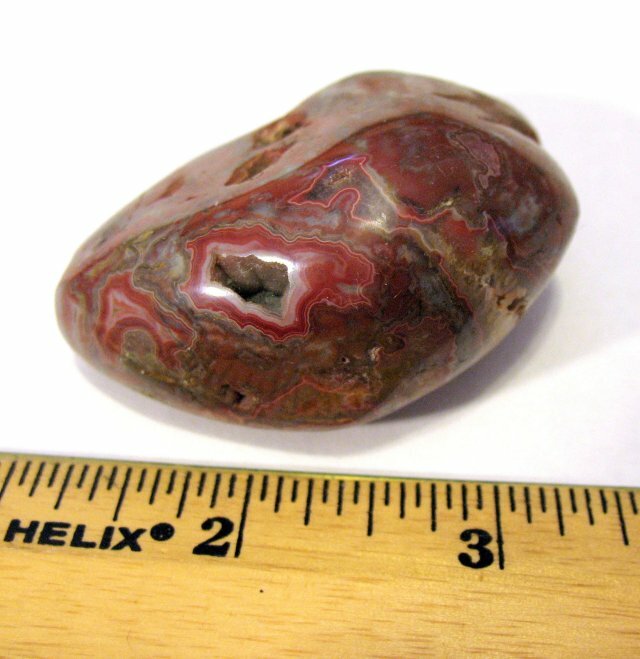 1-3/4" x 7/8". $17.00. #FBNE28. 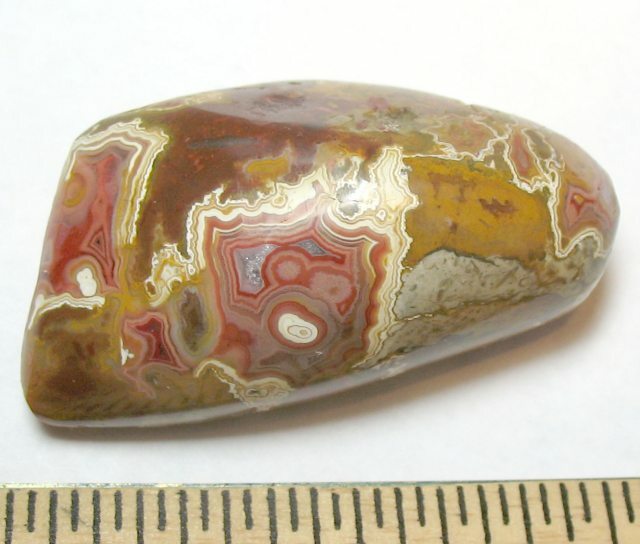 Face-polished Nebraska agate with deep red, light orange banding. Vuggy pattern on backside too, left natural. 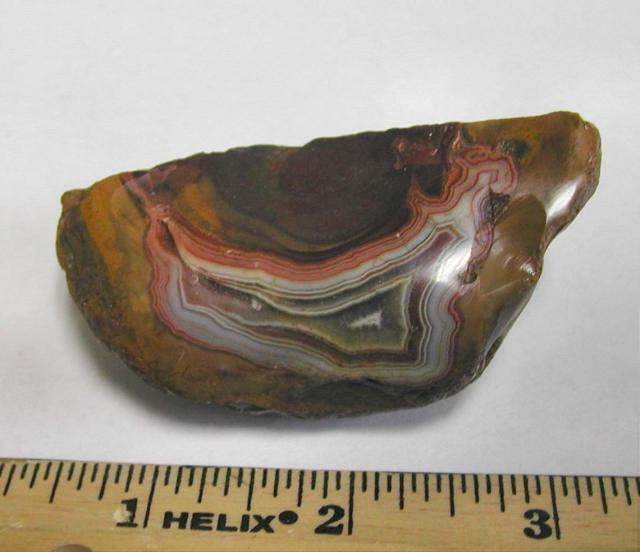 2-3/4" x 2" x 5/8", 3 oz. $35.00. SOLD. #FBNE29. 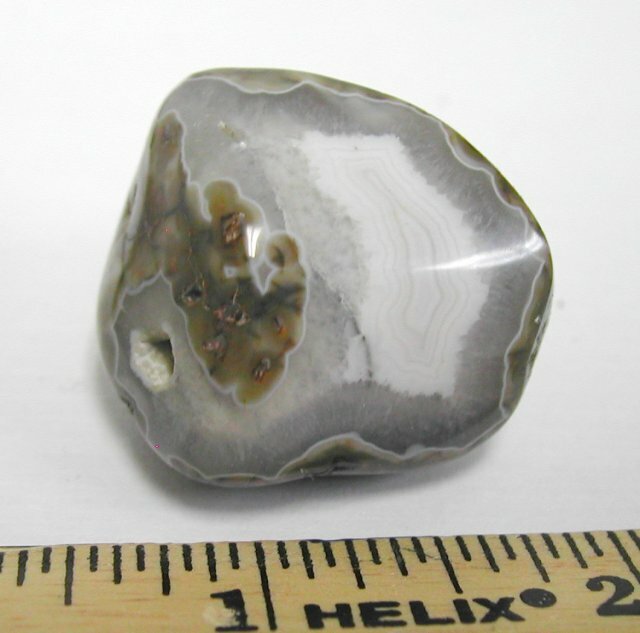 Cool pattern on this tumble-polished Nebraska agate, wraps around a bit. 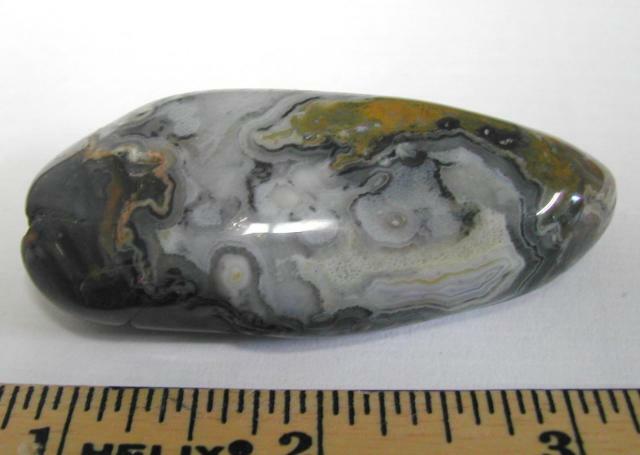 2" x 1-1/8" x 3/4", 1.6 oz. $35.00.